Home / Opinion / De La Salle Professor on 25% Shades of Fraud: "Comelec has patently betrayed public trust"
De La Salle Professor on 25% Shades of Fraud: "Comelec has patently betrayed public trust"
Political analyst, columnist and professor Antonio Contreras, on Tuesday, July 31, 2018, wrote a very striking opinion regarding the Commission on Elections (Comelec)'s decision to stood by the 25% ballot shading threshold that was used in counting the votes in the 2016 elections. discussed the rules of the minimum shading threshold and its importance, as it will determine which votes will be counted as valid. Likewise, the Professor showed his dismay over the issue and said that one can't resist the urge to express articulate outrage at how Comelec would now be able to concede in its remark submitted to the Presidential Electoral Tribunal (PET) that the 50 percent threshold had been abandoned quite a while back and was down to 20 percent in the 2013 elections, and to 25 percent in the 2016 elections, without complying with the transparency requirements set by the automated election law. Sir Contreras further gave emphasis on how evident that the Comelec, the specific same agency that is entrusted to secure the sacredness of our votes and the uprightness of our elections, has explicitly sold out its own particular order by changing a vital component of the automated election system without a legitimately numbered resolution. This as per Sir Contreras is definitely a fact that the Comelec has made a fraudulent act and patently betrayed public trust. 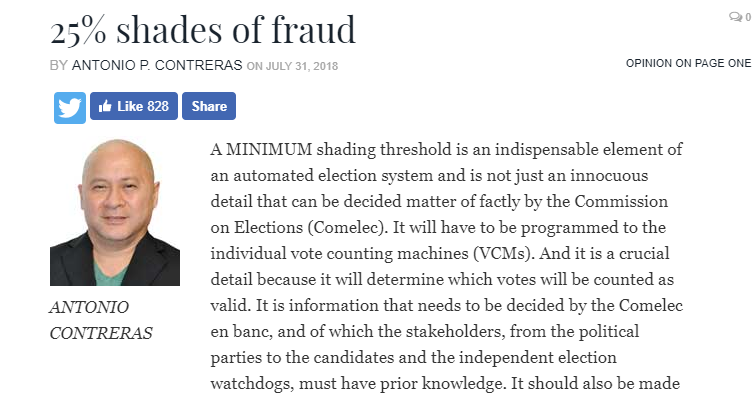 "A MINIMUM shading threshold is an indispensable element of an automated election system and is not just an innocuous detail that can be decided matter of factly by the Commission on Elections (Comelec). It will have to be programmed to the individual vote counting machines (VCMs). And it is a crucial detail because it will determine which votes will be counted as valid. It is information that needs to be decided by the Comelec en banc, and of which the stakeholders, from the political parties to the candidates and the independent election watchdogs, must have prior knowledge. It should also be made public to properly advise the voters to ensure that they mark their ballots accordingly so that their votes will be properly counted by the VCMs. It is not disputed that there is no single numbered Comelec resolution which amended this rule, not for the May 2013 elections, and certainly not for the May 2016 elections. What the Comelec issued on April 12, 2016 was Resolution 10088 which amended Resolution 10057, where Section 6 of the former amended Section 40 of the latter to now read: “The voter shall, using the ballot security folder and marking pen provided by the Commission, accomplish the ballot by fully shading the circle beside the names of the candidate and the organization participating in the party-list system of representation…” This is a clear indication of the Comelec’s intent to remind voters to fully shade their ballots, and this was matched by the information and education campaign materials which it disseminated directly to the public and was echoed by media and various civic organizations. 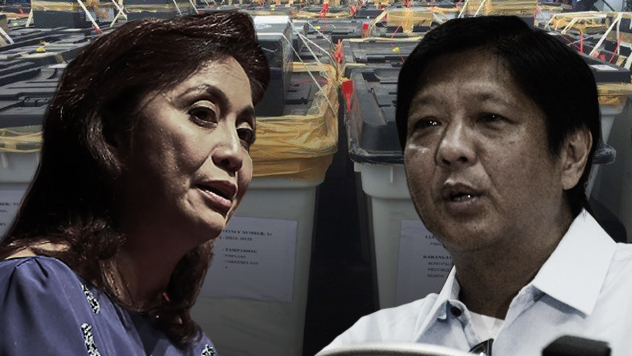 It is therefore in this atmosphere that one can’t help but express utter anger, if not total disbelief, at how Comelec can now admit in its comment submitted to the Presidential Electoral Tribunal (PET) — prepared by its legal department but was not signed by any single commissioner — that the 50 percent threshold had been abandoned a long time ago. This practically confirmed the earlier admission by former Comelec chairman Sixto Brillantes, Jr. that the threshold was lowered to 20 percent in the 2013 elections, and to 25 percent in the 2016 elections. It is now obvious that the Comelec, the very same agency that is tasked to protect the sanctity of our votes and the integrity of our elections, has blatantly betrayed its own mandate by changing an important feature of the automated election system without a properly numbered resolution, and without informing the voting public and the various election stakeholders. It is also now a glaring fact that the Comelec has tinkered with and has therefore undermined the integrity of the system by programming the VCMs to reflect the change in the minimum voting thresholds without complying with the transparency requirements set by the automated election law. Comelec now insists that it is constitutionally mandated to issue rules and regulations on the conduct of elections. No one is denying that it has the power and authority to do so. But what it conveniently forgets is that in a democracy governed by laws, rules and regulations are always made public prior to their implementation. They are not formulated in the cloak of secrecy and treated like protected trade secrets. The state is restrained from deceiving and misleading its citizens. Fidelity is a norm for government agencies, more so if they are mandated to implement and regulate activities that have a significant bearing on citizens’ rights, such as the conduct of elections. What the Comelec practically did was to make people believe that only a full shading can ensure that a voter will not be disenfranchised by spending millions to propagate that view through a massive information drive. Yet, they secretly altered the rules without informing the public, the candidates, the political parties and the election watchdogs. Comelec now uses as a defense the guidelines it formulated for the conduct of random manual audits, where it now specifically mentions 25 percent. Some Comelec apologists and defenders, mostly Robredo partisans, now proclaim that such document has clearly settled the issue and should put it to rest. However, the 25 percent rule articulated in the audit guidelines still begs the question of Comelec’s failure to make transparent the process of changing the threshold and the corresponding programs in the VCMs in violation of the election law. According to Comelec, one of the reasons for adopting a minimum threshold of 25 percent was to ensure that “no accidental or unintended small marks are counted as votes in order to reflect the true intent of the voter.” This is so idiotically irrational, considering that the chance of counting as valid votes the accidental or unintended small marks increases when you have smaller or lower thresholds. Indeed, automation begs Comelec to specify the shading threshold prior to elections, and for the public to be informed of such, to ensure that only valid votes will be counted. But it is inconceivable that the Comelec should opt for a lower 25 percent minimum shading threshold when that would have a higher chance of accidentally reading marks that are not intended as votes and would negate and put to waste the efforts to educate voters to shade fully. Comelec’s argument is patently bereft of reason, unless the intention is to aid the commission of a fraud. An unpublished shading threshold becomes a precious commodity for someone with the intent of revealing to a possible client the secretly held information that mass-manufactured dots on the ovals will still be read by the VCMs as valid votes because they are programmed to do so. After all, it is easier and faster to repetitively mark ballots in a wholesale manner with dots than to shade them fully. However, allegations of fraud are easy to make but hard to prove. 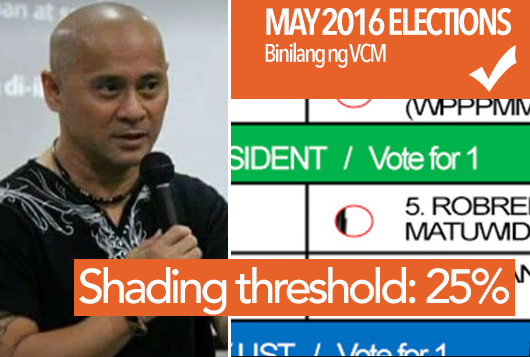 On the other hand, Comelec has already admitted that it lowered the shading threshold, and by implication has programmed it in the VCMs. And it is a fact that this was done without a resolution, and without informing the public and the relevant election stakeholders. These are facts that no longer need proof, and establish that Comelec has patently betrayed public trust, which is a ground for impeachment."